Coming in at about 13-15 feet in length, the Beluga Whale is one that is often mistaken. If you don’t know what you are looking for you may think it is a manatee. However that confusion could only happen in an aquarium as they both live in very different habitats. The Beluga Whale is a toothed whale so you will notice it has quite a bit of flexibility for movement around the head. The males can weigh up to 3,500 pounds with the females smaller at around 2,600. Many people also believe that the Beluga Whale has a dorsal fin. However, it is categorized as a ridge instead of a fin. Experts believe this is a type of physical characteristic that has evolved over time to help keep them warm. They also have short flippers and a long tail. The older this particular type of whale is, the longer the tail will become. The Beluga Whale has a very high pitched sound that they use for socializing. It is believed they spend more time interacting with each other than any other types of whales. The males tend to form very large clans with thousands of them during migrations. Females along with their babies form their own clans but tend to keep them smaller in size. Scientists do show that these offspring tend to return to the locations where they had been with their mothers though in most instances. They remember their mothers and bond year after year. It is surprising to learn that the Beluga Whale can dive thousands of feet into the waters. Most of the time they stay closer to the top. They have to surface for air approximately every 20 minutes. They will dive deep in order to find food though as they can get down and back up very quickly. This particular whale swims slowly so that it can find the food it desires. Their diet consists mainly of fish. During the migration process, their pattern tends to follow the salmon. However, they do consume crab, squid, and even shrimp when it is available to them. You will find the Beluga Whale in Russia, Canada, Alaska, and Greenland. They move to shallow bays when the summer is present. They do migrate quite a distance in the winter though to get to warmer waters. They are able to find cracks in the ice so that they can get air as needed when they come up from the depths of the water. How they are able to find them though continues to be a mystery that scientists hope to one day solves. 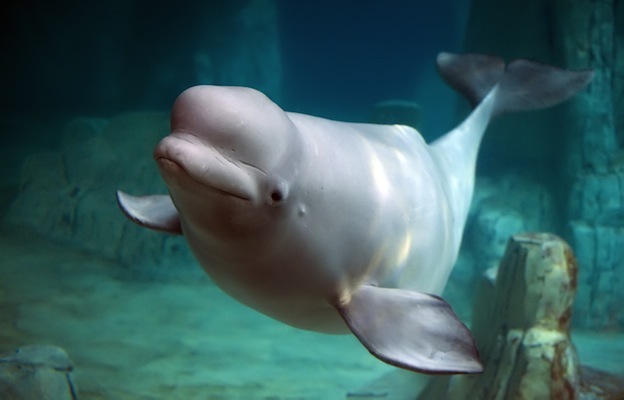 Most of the time the Beluga Whale females can conceive from February and May. However, there is evidence to suggest they can have a delay in conception so it is common to find mating taking place for them at other times of the year. The baby will nurse from its mother for about 2 years before venturing on its own. 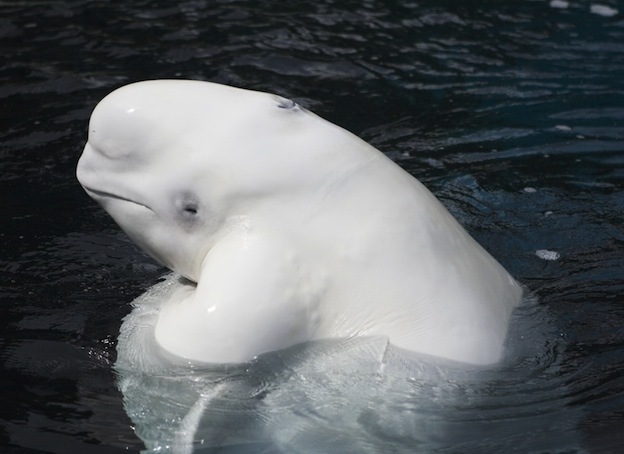 All of the Beluga Whales found in Alaska are protected due to them being on the endangered species list. It is possible for them to survive in the wild for about 50 years. There are less than 100,000 of them left in the world so such efforts need to be taken seriously. This particular whale has a predator other than humans which is rare. They are often hunted by polar bears. They have also been seen falling victim to the killer whale too. They biggest conservation efforts involve keeping the waters free from pollution. It continues to be hunted as well but at least in controlled numbers.